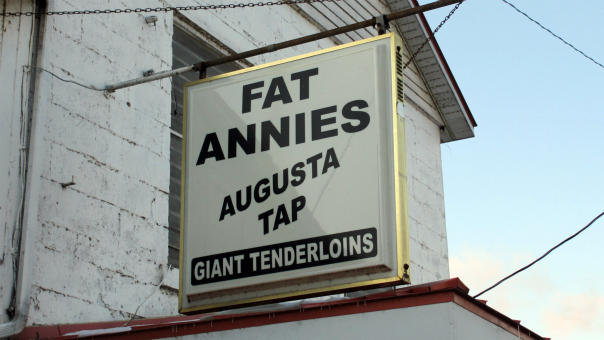 The sign reads Giant Tenderloins, the name on the sign is Fat Annie's Augusta Tap, and I just had to stop in during my last visit to Southeast Iowa. Fat Annie's is not related to Fat Randi's in Van Meter, nor is Augusta to be confused with the Augusta Restaurant in Oxford. Location: Its on the busy intersection of Augusta Main Road and Augusta Mill Road, beside the Skunk River in the unincorporated township of Augusta in Des Moines County, Southestern Iowa. Directions: The closest town is Wever, but most people are driving along Highway 61 between Burlington and Ft. Madison. Take Highway 61 to State Highway 16, then go north on County Road X-38 which runs over a bridge into Augusta. 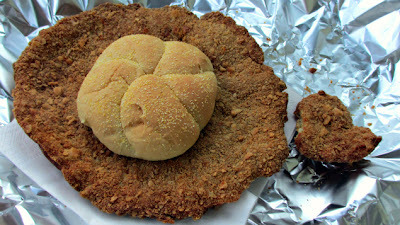 The Tenderloin: This was a huge sandwich, weighing well more that the 8 ounces that many places give me. the sandwich was almost too big to get a picture from my car as the sun was setting. 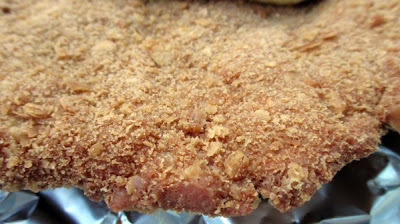 The meat was tenderized well and a little piece on the edge fell off when I unwrapped the tin foil. Most of the sandwich was thick and closer to moist than juicy. 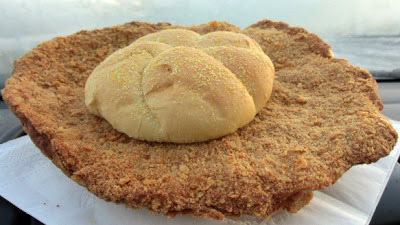 Breading had a cracker crunch and left crumbs everywhere. The kaiser bun just couldn't handle the wight of the oversize sandwich and fell apart. Overall 7.5 out of ten. Also on the menu: the regular fried food and bar staples are here in abundance, including burgers and fried chicken. Fat Annies is close to the Big River, and serves carp and catfish like other bars in this area. Service: Typical small town bar style, with bartenders making small talk with regulars who seemed to have been there forever. Ambiance: There is the usual old wood paneling, booths, dark atmosphere, beer signs, and outdoors photos. But the wall seems to be covered with carpet fragments cut into a large geometrical mural then stapled to the wall. The bar area and back seem to be covered in floor lamination, the whole place just boggles the mind. Final Thoughts: Augusta looks like an old mill town, and Fat Annies seems to be the oldest building close to the river. 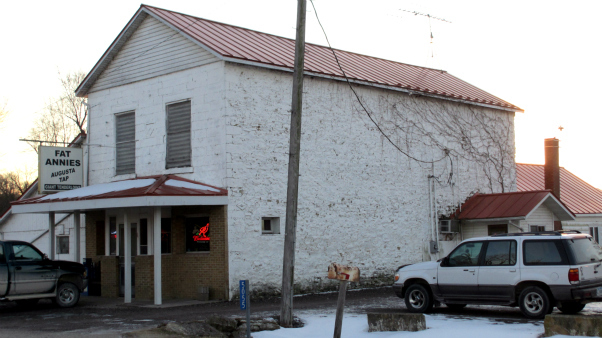 The ambiance of the historic building seems to be lost with the latest renovations. I've seen some small town dive bars in my time but this place is epic.I took photos and notes about the tenderloin but all that I can remember is the decorations of the interior. Every time I am in the Augusta area I stop here for the Big Tenderloin. They have two styles, thick and thin. The big one is the thin and the best in my opinion. Nice and crunchy. The ambiance is nothing to speak of but the kitchen is clean. I have been eating here since 1959. Its a local farming tavern and always fun to see old friends.